Are you ready for your next challenge?! We’d like to thank everyone who entered into last weeks Birthday challenge. Wow, you make beautiful cards! It's so fun to travel around seeing everyone’s creations, a big thank you to everyone who played along! Our challenge this week is a technique challenge! We challenge you to make an Easel card for one of our hero’s to send home to their loved ones! 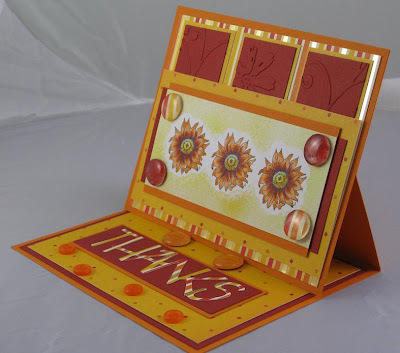 In case you’re new to making easel cards I’ve provided a link to Splitcoaststampers where you'll find a wonderful step by step tutorial by Beate Johns as well as a video! Our sample card this week was made by Ann, to see more of her gorgeous art work please visit her blog AnnFran. Thank you Ann for sharing your awesome creativity with us! Easel cards are so easy and look so nice! Love this sample card, too. Sounds like fun and I haven't made an easel card for awhile now, so I'm happy to get back into them! I really love the design. It's been such fun month here and I only wish I have MORE time to try every challenge but I thank everyone for all the great inspiration and ideas. Its' been a pleasure me find lots of fun new challenges too!! Congratulation ANN!! Silly me I just realized today that the wonderful inspiration card was yours!! It's fabulous and I'm so happy you shared it here as inspiration for us all! Thank you Julie for the link to the tut. And thank you Jan for pointing me to it in the comment you left me. Now I need to go edit my post and add a link to this tut, because for me, this would have been less confusing. It is not the one I found several weeks ago, but the direction of the folds would have made more sense to me.